Through an Owner's Eye: What is your successful day? Home › Running Tips/Blogs › Fleet Feet Beat › Through an Owner's Eye: What is your successful day? Boots and I were quite lucky to spent the majority of last week in Seattle, Washington with Brooks Running, in their new headquarters over looking Lake Union. We had the opportunity to meet several other Run Specialty accounts in the US, while spending time with the CEO of Brooks, their Sales Department, Marketing Departments along with Product Development for footwear and apparel. We even got to partake in the Live Launch and broadcast of the new and innovative Brooks Levitate Shoe coming September 30th to Fleet Feet Sports. As I alluded last week, retail is indeed in a unique spot, but being in Run Specialty we are fortunate to have vendor partners such as Brooks who support us and are willing to provide unique products to our industry. Such as the new Cobalt Gardens Apparel Collection which was made special for Fleet Feet Sports and in store now (pics below). And, wow are they beautiful pieces. Cruised through my Monday from meetings to finally a run in the Ghost Crop. Extremely well constructed, comfortable and compressive garment. And apparently motivating as you read on. As the weekend approached the first of two Rochester Regional Health Flower City Half Marathon Preview Runs occurred. 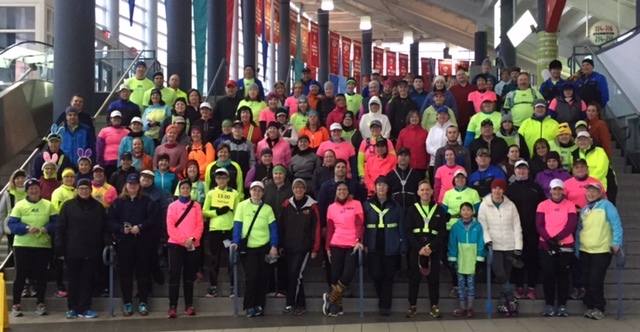 Between the half and 5K preview over 350 joined us downtown at Blue Cross Arena to venture on the course. What’s the best part? About 50% of them ran a distance they have never ever completed before. As they finished their routes congregating back at the arena in the mist, through an owner's eye, the pride witnessed by many was real. They now have a sense of confidence for April 30th, race day. Sunday SPRING finally hit our area with sunshine and warmer weather. The stores were bustling with people getting fit for footwear, ready to finally get outside in hopes winter is behind us. It was so nice, our RunNRide Class had a chance to ride outside under the overhang outside the Armory. Ahhh…so perfect. Look out for the next session starting in May, where hopefully most classes will be outside. Then Monday, which is my catch up day. But in truth, the day revolved around those darn Brooks Cobalt Garden Ghost Crop Bottoms. No Lie! It reminded me of the traveling pants book. I finally got a pair and was ready to wear them. So I planned my day around them. Yes, this is strange. My day revolved around a garment. Why? Well, as an owner I have chosen to work more and play less. My life is about our 50 staff members and our customers. Thirteen years ago I made the decision to serve staff and customers. Therefore, like many of us, I honestly don’t serve myself much. Again, a way of life I chose and wouldn’t give up at all. However, every once in a while I go through a period where I remind myself that it’s important for people to take time for themselves. Heck, it’s what I try to teach to all our training participants. While of course still doing what I love at the stores and races. Today was one of those days, where with a new pretty garment, it was a new day. It was as though it helped recharge and redefine what I need. So my goal was to put on these new, apparently now magical recharging pants, and go to my back to back meetings in hopes that in the end I will finish the day with a run in them. A task far too often I forgo, because well, like many……I just get too (fill in any excuse). But someone said midday to me, what does a successful day look like to you? So as I was gallivanting around in my new garb, I was determined to meet that final task of going for an end of day run in those pants. And I did. That, there was my successful day. What does your successful day look like?